NatureWord – Page 3 – Trustworthy health information resource. The Italians call it ‘aragosta’. Locally, in the Mediterranean region, it bears a more geographic name: Mediterranean lobster. 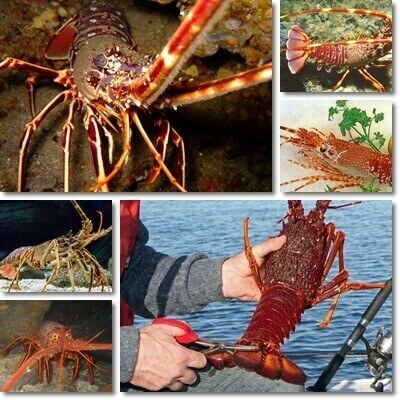 In the US and Europe it’s commonly known as red lobster, spiny lobster, rock lobster or European spiny lobster. In Ireland, South Africa, New Zealand and Australia it goes by the names of crayfish and crawfish. The scientific name is Palinurus elephas and it is an edible crustacean, culinary delicacy and source of excellent nutrition with the potential for providing important health benefits. What is the difference? True lobsters such as the American lobster (Homarus americanus) and the European lobster (Homarus gammarus) are only distantly related to spiny lobster species such as Palinurus elephas, regionally known as crayfish or crawfish. Probably the easiest way to distinguish between the two types is by the presence or lack of claws. The biggest difference everyone can pick up is this: true lobsters all have a pair of large claws or pincers in the front, whereas spiny lobsters don’t; instead they just have walking legs which are like thin, elongated, antenna-like. Colors also differ between the two. The most commercially important species of true lobster are naturally darker in color, with green, blue, brown to help them camouflage by harmonizing with the ocean floor. They only turn red after being cooked. Whereas spiny lobsters are mostly red, reddish-brown before cooking, hence the reason they are also sometimes called red lobsters. Lastly, another difference is spiny lobster species have visibly thicker and longer antennae compared to the first. Spiny or rock lobsters, known as crayfish, crawfish or langouste in some regions, don’t have any claws, just thin legs. And because they don’t have claws, only the abdomen, generically called ‘the tail’ is the primary source of meat and, consequently, also nutrition. 1) High protein content: on average, 20-26 g of protein per 100 g of tail meat. 2) Extremely low-fat: only 1.5-1.9 g of fat. 3) High in phosphorus: between 230-250 mg of phosphorus, or the equivalent of 25 to 30% of the recommended daily intake, RDI for an average adult. 4) Good calcium content: on average, 50-65 mg of calcium. 5) Good source of magnesium: about 40-50 mg of magnesium, roughly 10% of the recommended daily intake, RDI for an average adult. 6) Modest source of potassium: 180-208 mg (the average adult needs 4500 mg a day). 7) Modest source of iron: 1.2-1.4 mg (the average adult requires 18 mg according to the old RDI values and only 8 mg according to the new RDI values). 8) High in sodium: 177-227 mg of sodium, considering adults should limit their intake to 2300 mg a day. 9) Excellent source of zinc: 5.67-7.27 mg of zinc (the average adult requires 15 mg of zinc a day according to old RDI values and 8-11 mg according to new RDI values). 10) Excellent source of vitamin B12: 3.5-4 micrograms (old RDI sets intake at 6 micrograms a day, while new RDI sets intake at 2.4 mcg a day for the average adult). 11) Good source of niacin (vitamin B3): 4.25-4.9 mg of vitamin B3 (old RDI sets intake at 20 mg a day, while new RDI sets intake at 14-16 mg a day for the average adult). 12) High in cholesterol: with 70-90 mg of cholesterol, considering adults should limit their intake to 300 mg a day. Nutrition facts determined for 100 g of spiny or rock lobster ‘tail’ meat, raw and cooked. 1) Benefits associated with a high protein content. First of all, protein builds and repairs damaged muscle. Secondly, it is used by the immune system in the fight against infection and disease. Thirdly, the amino acids that make up protein are used by the nervous system to create neurotransmitters that regulate mental health, including functions such as mood, appetite and sleep. Lastly, foods high in protein such as spiny lobster help combat brain fog and contribute towards maintain a healthy weight. 2) Important benefits for the brain. Spiny lobster meat contains healthy EPA and DHA Omega-3 fatty acids that help make up cell membranes and are physically part of the brain. Getting enough of these two types of Omega-3 every day helps maintain normal brain function in adults and may help combat early cognitive decline. Moreover, the healthy fats have been theorized to hold benefits for depression and anxiety. Cholesterol together with excellent amounts of vitamin B12 protect the myelin coating surrounding the tail of nerve cells and further help prevent cognitive decline associated with degradation of said coating. 3) Boosts energy and restores vitality. 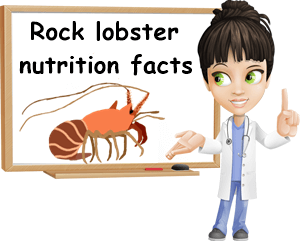 As a varied source of B vitamins and especially high in vitamin B12, rock lobster meat holds benefits for energy metabolism, elevating energy levels and restoring vitality. Vitamin B12 in particular is vital for making red blood cells, promoting vigor and strength. 4) Combats anemia. Eating spiny lobster has anti-anemia effects thanks to its excellent vitamin B12 content as well as high iron content. Both vitamin B12 and iron help make red blood cells and combat fatigue and weakness associated with anemia. 5) Good for the heart. The two types of Omega-3 fatty acids found in spiny lobster and most seafood are scientifically proven to hold anti-inflammatory action which benefits cardiovascular health. There are also good amounts of potassium and magnesium which normally contribute towards healthier blood pressure numbers, but the significantly higher sodium content cancels out the anti-hypertensive effects of the other minerals. 6) Benefits for fertility. Believe it or not, the cholesterol in lobster and other seafood and animal products helps synthesize hormones for the endocrine system, indirectly contributing to fertility. Moreover, cholesterol helps us use vitamin D, a nutrient vital for female fertility. 7) Good for skin. Only 100 g of spiny lobster gets you roughly between 20-30% of your entire niacin or vitamin B3 intake for the day. This particular vitamin as well as all the other B vitamins present in the lobster meat help prevent dry, cracked skin, sores and inflammation of the skin. Fats further help promote skin health and hold antioxidant and anti-inflammatory effects. 8) Benefits for bone health. Rich in phosphorus and a good source of calcium and magnesium, the lobster species helps build and maintain a strong, healthy bone frame. Magnesium further optimizes calcium absorption into bones. 9) Contributes to a stronger immune system. Because it’s rich in zinc, providing 5.67-7.27 mg per 100 g. According to new RDI values, the average adult requires 8-11 mg of zinc a day, so a single 100 g serving of spiny lobster meat can get you 50% or more of your entire day’s intake of the mineral for better immunity. 1) Allergic reaction. If you are allergic to lobster, avoid it in all forms and preparations in order to prevent an allergic reaction that could potentially culminate in anaphylactic shock. 2) Bacterial or parasitic infections. Lobster and any type of seafood requires thorough cooking to prevent bacterial or parasitic infections. Spiny lobster species in particular can be sources of Vibrio bacteria or various intestinal parasites. Small children, pregnant women, the elderly and anyone with a compromised immune system or deficiency are the most at risk for complications from the infections. 3) Source of mercury and other heavy metals. While levels fluctuate greatly depending on where the spiny lobster comes from, it is generally a source of mercury and can produce disease if consumed in excessive amounts for long periods of time. The heavy metal is known to attack the nervous system and produce sometimes irreparable damage. 4) Can cause high blood pressure. Spiny lobster is high in sodium and thus contraindicated for anyone with high blood pressure. If eaten in excess or too frequently, it can contribute to hypertension and associated symptoms, including water retention and swelling of the arms, legs, abdomen or face puffiness. 5) High-cholesterol food. Some of the most delicious seafood are high in cholesterol, including shrimp and lobster. While it provides important benefits for the brain and is vital for hormone production and fertility, cholesterol is best not consumed in excess to avoid cardiovascular problems. Spiny lobster and pregnancy. While healthy, spiny lobster is not an essential food and can, in some instances, be harmful, such as in pregnancy. Pregnant women are advised to limit their intake of seafood, especially types of seafood that are higher in mercury or other heavy metals, including spiny or rock lobster, true lobster or tuna. They are also advised to thoroughly cook seafood to avoid bacterial or parasitic infection that could potentially cause a miscarriage. Given it’s high-sodium, spiny lobster can accentuate high blood pressure, fluid retention and swelling, contributing to preeclampsia symptoms. As for the benefits of eating spiny lobster in pregnancy, the good kind of fats and rich vitamin B12 content this particular meat has contribute to the normal brain and nervous system development of the baby in the womb. Pregnant women also benefit from the high vitamin B12 and iron content of lobster meat. In addition to producing red blood cells and supporting the overstrained cardiovascular system of the soon to be new mother, they combat fatigue, weakness and restore vitality for improved energy levels.